Christmas day, and DCI Tom Reynolds receives an alarming call. A mass grave has been discovered on Oileán na Caillte, the island which housed the controversial psychiatric institution St. Christina's. The hospital has been closed for decades and onsite graves were tragically common. Reynolds thinks his adversarial boss is handing him a cold case to sideline him. But then it transpires another body has been discovered amongst the dead - one of the doctors who went missing from the hospital in mysterious circumstances forty years ago. He appears to have been brutally murdered. As events take a sudden turn, nothing can prepare Reynolds and his team for what they are about to discover once they arrive on the island . . . The mass grave on the island off the coast of County Kerry accommodates 60 bodies going back decades, The site is to be cleared for a new hotel complex but work stops so that the bodies can be lifted and re-located. All of the bodies have been put into body bags and tagged with names etc. But one does not belong. It has been wrapped in plastic and hidden under the top layer in the mass grave. And it has probably been there for 40 years when a promising young doctor disappeared. That he is called about the case on Christmas Day and expected to go to the site almost immediately is a measure of the malevolence that DCI Reynolds' Superintendent has for him, and typical of how he has been treated for the past 6 months. There is pressure from the Chief Commissioner for this cold case to be treated with priority because of familial links with the wife of the missing man. The wife gives Reynolds a diary she thinks the missing man left at home when he was last there forty years ago. For forty years she has held on to the hope that he will turn up. It makes for horrific reading. There is some interesting discussion of how treatments of insanity and depression have changed over the last 40 years - provided by a clinical psychiatrist that Reynolds takes as part of his small team. 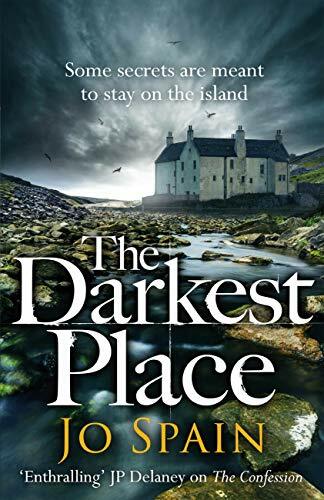 This is the first novel that I have read by this author and I didn't feel my reading was at all impaired by not knowing the content of the previous three titles in the series. Although there were some references to earlier cases. Jo Spain is vice-chair of business body InterTrade Ireland and a parliamentary assistant in Leinster House. Her first novel With our Blessing is published by Quercus, London and was one of seven books shortlisted in the Richard and Judy search for a bestseller competition 2014. The book is based on the investigations of a Dublin-based detective team led by Tom Reynolds. It was launched in Ireland in September 2015 and became a top-ten bestseller that month. It will be launched in Britain in 2016 and the rights have been snapped up in Germany. She has received rave reviews from Martin Sixsmith (author of Philomena) and Sinead Crowley (Can anybody help me?) as well as in leading media and blogs. Jo lives in Dublin with her husband and their four young children.